American Staffordshire Terrier. 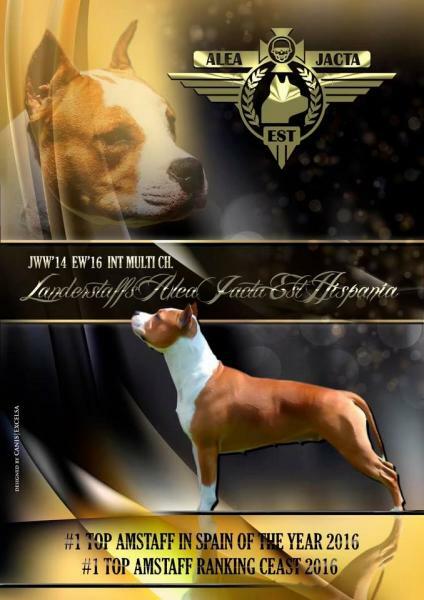 AKC CH CASANOVA S RUMOR HAS IT. American Staffordshire Terrier. LLanderStaffs Alea Jacta Est Hispania. American Staffordshire Terrier. Alea Jacta Est Kiss My Boots. American Staffordshire Terrier. Camada 3ª Generacion. American Staffordshire Terrier. Odylic´s Mystik Taboo. American Staffordshire Terrier. Camada Nueva. American Staffordshire Terrier. Lakota´s Two Bears Spirit. American Staffordshire Terrier. Obsessions The Great Gatsby. American Staffordshire Terrier. Timbarland´s Pixie Stick Ra.